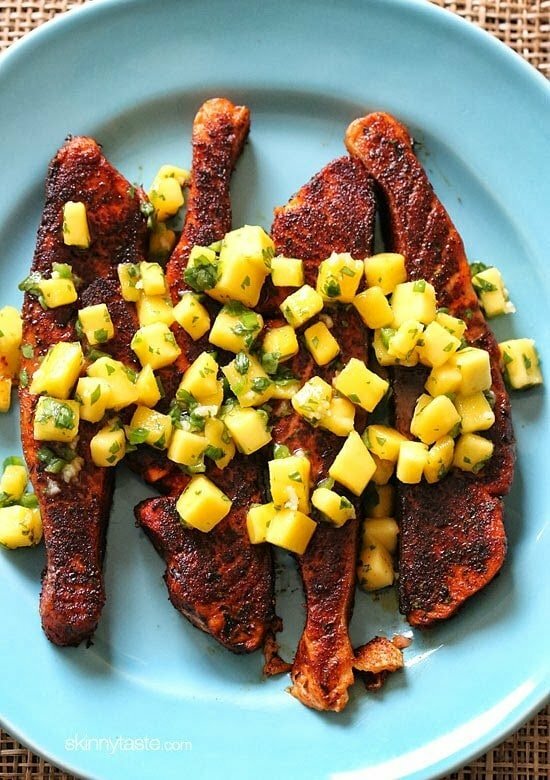 Blackened wild salmon fillets seasoned with blackened seasoning such as cayenne, paprika and herbs are seared in a skillet then topped with a fresh mango salsa – if you can take the heat, then you’ll love this dish! I love salmon, some of my favorite salmon recipes here are Salmon with Avocado Bruschetta, Maple Soy Glazed Salmon, and Honey Teriyaki Salmon, just to name a few! 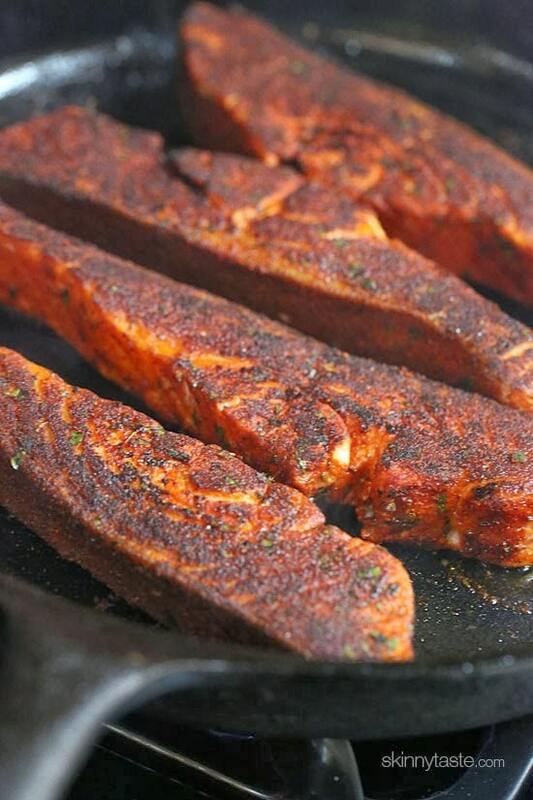 I’m always looking for new ways to prepare salmon and loved this healthy Blackened Salmon! The spice on the salmon pairs perfectly with the sweetness of the mango salsa. I searched for a good blackened spice rub and came upon a recipe from Alex Guarnaschelli. Now, I’m a little bit of a spice wimp, I will admit and I had to open my windows while this cooked because the spice was making me cough (yikes!). Naturally I was kinda nervous that this would be too spicy for my taste buds, but the sweet mango salsa gave me a relief from the heat and although it was a little hot, I was able to eat it just fine (along with a glass of water). You can double or triple the spice mix. Combine the paprika, cayenne, thyme, oregano and salt in a bowl until evenly mixed. Store in an airtight container in a cool, dry place. 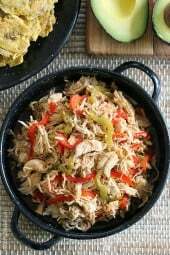 Next time I make this, I may use less cayenne to tone it down, but if you like it hot I wouldn’t change a thing! I used salmon because of all the wonderful omegas but you can use whatever fish you like (cooking time may need to be adjusted) or try these Blackened Scallops! This is ready in less than 30 minutes start to finish, so it’s perfect for a weeknight meal. Enjoy! Combine all the salsa ingredients in a bowl, season to taste with salt and pepper and refrigerate salsa until ready to serve. Makes 1 cup. In a small bowl, add the paprika, cayenne, thyme and oregano and salt and mix to blend. Put the mixture on a plate or other flat surface and coat the salmon fillets. 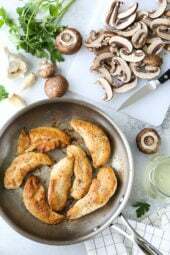 Heat a large heavy-bottomed pan or cast iron skillet over medium heat, and generously spray with oil. When very hot add the salmon, flesh side down and cook for 2 to 3 minutes. Use a spatula to carefully turn the salmon, then cook an additional 5 to 6 minutes. Serve topped with salsa. Arrange the salmon on a platter, top with mango salsa and serve immediately. I’m making this now and my house is filled with smoke from the cast iron skillet. filled and the fish isn’t cooked all the way through. . I’m having to put it in the oven to finish cooking. Not sure what it will taste like… any suggestions on what I can do better next time? I made this last night, I made some adjustments to ensure it was not too spicy. I only used about 1/2 tsp on cayenne and I used about 1 tbsp of blackening seasoning I had on hand. Turned out fantastic and kid friendly, both kids (8 and 2) and my wife who rarely eats fish loved it. We will be making this again. Thanks Gina! I made this recipe last night for dinner and it was unbearably spicy. So spicy, my husband and I couldn't even eat it! We were all coughing so much from just the smell of the cooking the salmon. I followed the recipe so I'm not sure why we had issues. I made this for my boyfriend and I last night, it was amazing. I used a bottled cajun blackening spice mix that I already had on hand, but I appreciate the directions for cooking the salmon as I haven't really cooked fish before. It turned out perfectly. I also added about 2/3 of a fresh jalapeno, minced (no seeds), to the salsa as another commenter mentioned. I would highly recommend throwing that in, it gives the salsa a really nice heat, not too much though. My boyfriend usually eats slowly, but he practically inhaled this dish and finished it with a sincere "well THAT was delicious." Best compliment I could ask for. 🙂 Thanks Gina! Made this for my family last night. It was fantastic! I prepared it as directed. It was definitely spicy, but with the mango salsa it was perfect for me. A little too spicy for my mother as is, so I will modify to 1/2 chili powder 1/2 cayenne as recommended next time I serve it when she is over. What would the measurements be if I used dried herbs instead of fresh herbs? Tried this tonight and it was greaaat! I made this for my boyfriend tonight with the Fiesta Lime Rice. It was amazing! Thank you for this delicious recipe. Will definitely be making again! Can you bake this salmon instead of cooking it in the pan? Every time my husband and I try to cook fish indoors, our home ends up smelling like fish for days. We're hoping that baking it could provide a better outcome! can you use salmon without the skin-on? 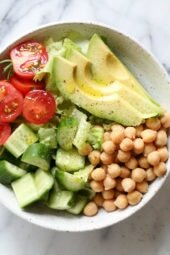 Made this with the frozen chunk mango (store brand) and it was fabulous! I made this for my boyfriend and his roommate last night. His roommate is not a fan of salmon, but hey, free food. We all LOVED it and roommate was even raving about it this morning. I used your tip of using half cayenne and half chili powder and thought it was plenty hot (and I like it spicy). The mango salsa was amazing, the perfect partner for this. I am not a fan of fish at all, but I can tolerate it if it's covered with enough 'stuff' – which usually defeats the benefits of eating fish. But I decided to make this since my husband loves Salmon, and we both like spicy dishes. Yes, I could taste a bit of the fish, but I liked this dish, and my husband LOVED it. I will definitely make this again. HIGHLY recommended, and very easy. I made this for dinner and it was both easy and delicious. I can never satisfy my husband's need for spice and boy did this do it! Thanks! Made this for dinner last night and it was absolutely delicious. It will be added to our list of go-to's for sure. I love spicy so this could be the perfect recipe. And it really looks easy and fast. i am so making this! except i have paul prudhomme's blackened fish seasoning… so I'm probably just going to use that! I always take a vegetable peeler to the mango before I cut it off the stone. Then just slice or dice. That sounds like a great way to cut the mango….skin off first! I'm going to try this tomorrow. We like spicy in this house, but I've never made blackened fish before. To cut fresh mango, hold it upright and cut down just to the side of the very middle (so that you'll cut a little less than half of the fruit off while leaving the large seed in the middle). Do the same with the other half of the fruit, leaving the seed in the middle, and then discard the part with the seed. This leaves a bit of fruit still attached to the seed, but it's negligible. With the skin still on the "halves" you keep, use the tip of your knife to cut a grid into the fruit without cutting into the skin. Invert, and then shave the fruit from the skin. Instant chunks. Repeat with the other "half." I think this is going to be Friday night's dinner! 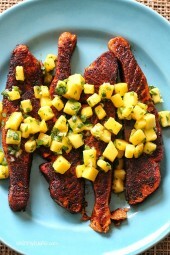 We love mango and fish! This looks delish. 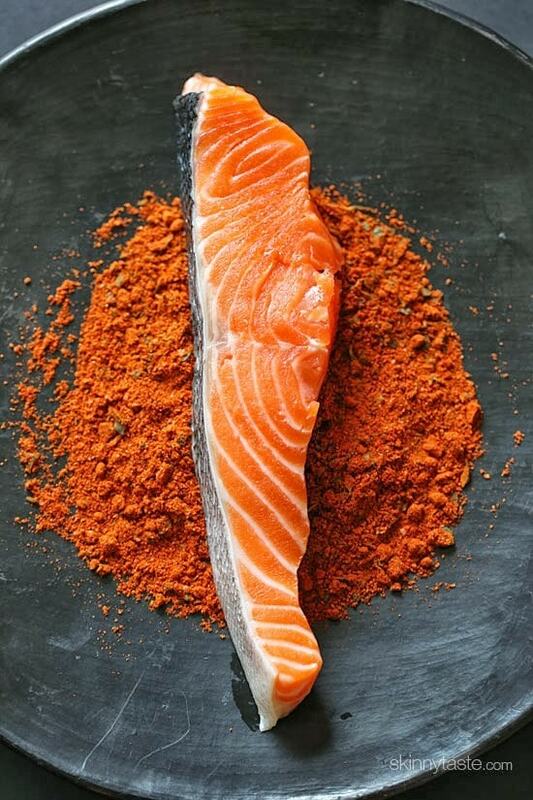 I am always wanting to learn new ways to spice up salmon – I will definitely takes these tips and make it at home. http://youtu.be/mDHSf7LVWJA This will show you how to cut mangos in different ways. Gorgeous! I need to stock up on mangoes now! You have to buy the yellow mangoes. They are smaller but bettter for getting all the flesh off the pit. Hi Gina. I have the hardest time with fresh mango. I just don't know the secret to cutting one up. I tend to get very little fruit and become completely covered in juice. Do you have any tips? the trick with cutting mangos is to slice down as close to the stone as you can get without cutting into it. when you have the slice, score it in several places and invert that slice so the scored fruit is kind of pushed out…take a sharp knife and slice the scored pieces off the original slice. hope this helps! also you can google this, it might be easier to look at to see what i'm trying to say. I will try to include picture of how I cut them next time I post a recipe with mangoes. super late on this and not sure if everyone already does this and I'm the last to catch on… but the best is to use a potato skinner first to get the skin off! It makes it SO much easier to cut and you lose WAY less mango!